Though long known, this lily was not first officially described until 1955 at which time is was known as L. roezlii. 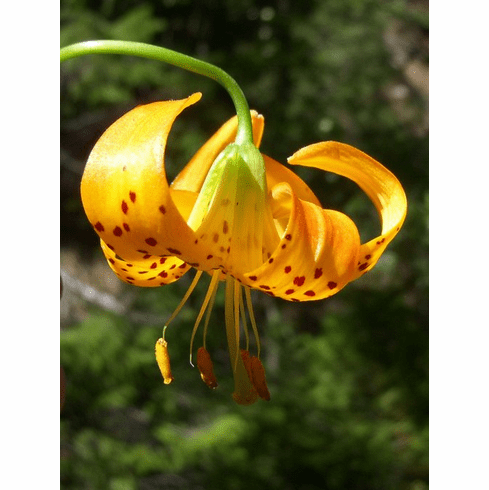 A wet land type lily native to Northern California and Southern Oregon, the golden-yellow nodding flowers are spotted in purple-red. Carrying a light but pleasing fragrance, this species prefers a well drained, rich soil and some light dappled shade. Lilium wigginsii has been seen flourishing on hillsides where a constant flow of clear, fresh water is running over the bulbs. Seed of L. wigginsii germinates hypogeally in the late autumn when it is cool. Title photo was taken by Neil Kramer in Siskiyou County, California. Copyright Neil Kramer, all rights reserved. Used with permission. Photo inset #1 was taken of a colony located within the Hoopa Indian Reservation that was well hidden from roadside view. Discovered by the late Jim Robinette, he and his wife beamed with excitement after being asked "why are we stopping here". About 30 feet in through thick bramble was an open hillside with hundreds of 3 to 6 foot tall stems in full bloom. Photo insert #2 is close up of individual flower in this colony showing pollen anthers of a cinnamon color rather than the common bright yellow. Filaments on this flower were also much longer than "normal". Photo insert #3 was taken by John Doyden in Siskiyou County, California. Copyright John Doyden, all rights reserved. Used with written permission. Source CalPhotos. Original was cropped. Photo insert #4 was taken by Dana York in the Klamath National Forest. Copyright Dana York, all rights reserved. Source CalPhotos. Original was cropped. This image has a Creative Commons Attribution-NonCommercial-NoDerivs 3.0 (CC BY-NC-ND 3.0) license.